Poosanikai kootu |ash gourd kootu is the one which is made in mils place during all festivals like deepavali, pongal, tamil new year, navaratri pooja and the list goes on. Whereas my mom makes Sambar for most of the occasions. All of them in the family likes this kootu very much and some times ash gourd will be replaced with brinjals too. 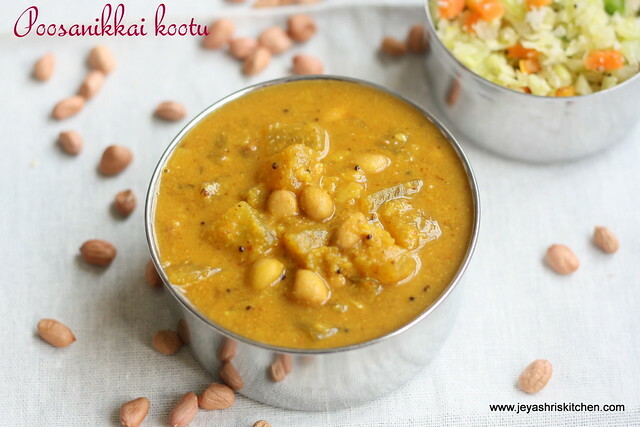 Traditionally raw peanuts are added to this kootu but many times we replace with black channa too. 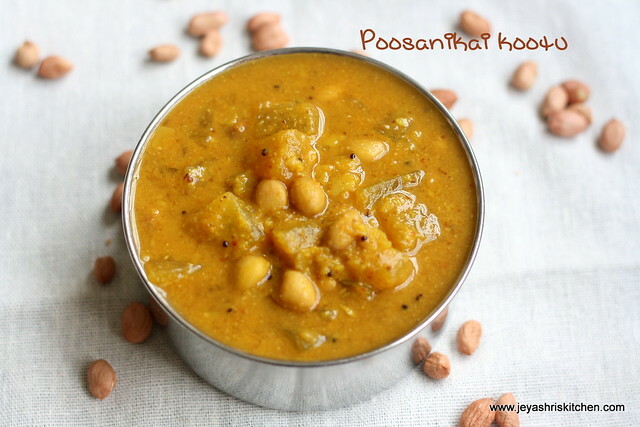 We call it as poosnikai puliita kootu ( ash gourd kootu with tamarind) . This recipe is similar to Arachuvitta sambar but with few small variations. This recipe i clicked long back, but some how missed to post. When i was seeing the pictures album today, i saw this and as the pictures looked decent, i thought i will post. The step wise pictures , will be updated with good ones soon. Take out the skin of the ash gourd and cut them into cubes. 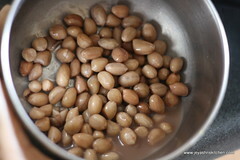 Soak the peanuts for an hour and pressure cook it without adding much water. Add little salt while cooking the peanuts. 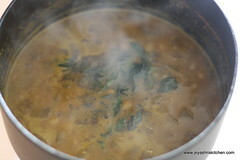 Pressure cook the toor dal by adding little turmeric powder. The dal should be mushy. Roast all the ingredients given under the head "To Grind". Roast by adding few drops of oil. When the dals turn golden brown colour switch off the flame and allow this to cool. 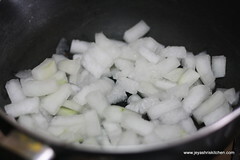 Meanwhile , in a pan add the cut ash gourd and add the tamarind water. Add salt, turmeric powder, asafoetida, sambar powder and salt. 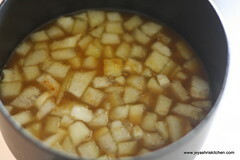 Let this boil for few minutes till the raw smell of the tamarind and sambar powder goes. 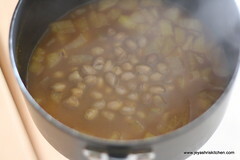 While it is cooking in the half way add the cooked peanuts. Drain extra water if any, before adding it. 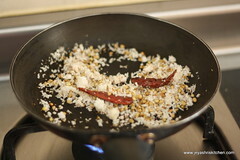 Add the cooked toor dal and grind the ingredients which we roasted. Grind using little water and make it to a paste. Let this boil nicely and then temper with mustard seeds and curry leaves. We had with cabbage carrot curry. You can have this with any dry curry of your choice. Peanuts can be replaced with black channa or white channa. Soak it overnight or 7 hours and make in the same way. 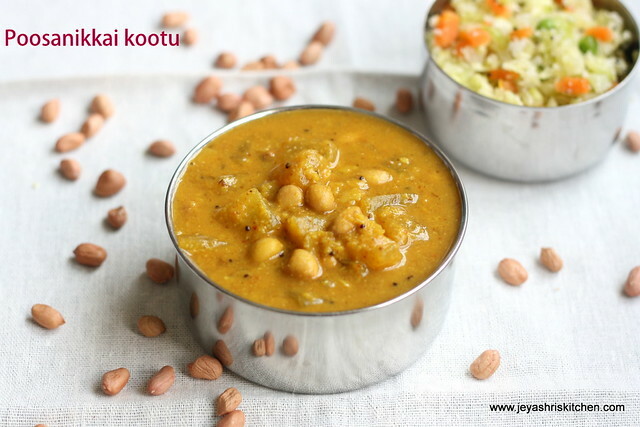 Healthy and delicious looking kootu. Yes sivaranjani, we belong (in my mil's side) from North Arcot only. Looks really good and delicious.. thanks for the recipe! !